Nowruz or Norooz, also known as Persian New Year, is an Islamic spring festival taking place during the vernal equinox on March 21 in 2015. This 3,000 year old celebration began with the Zoroastrians living in the area or Persia, now known as Iran. Today, Muslims in many Middle Eastern countries—such as Iraq, Afghanistan, India, Pakistan—and Canada and the U.S. celebrate Nowruz each year. Other items on the Haft Sin table can include other symbolic objects such as a mirror, decorated eggs, hyacinths, candles, goldfish, rosewater, a few coins, oranges, a brazier, and pomegranates. Greeting Card Universe offers traditional and modern designs for your celebration with our collection of one of a kind Nowruz cards to send your best wishes from your house to family, friends and co-workers. Need a last minute card? Order on-line, get free in-store pick-up, usually in 1 hour, at most Target and Bartell Drug Stores. What Are Happy Shoppers Saying About Greeting Card Universe? Persian New Year, also called Norooz or Nowruz, was originally a Zoroastrian festival, is today celebrated by Iranian people around the world and marks the Vernal Equinox, the first day of Spring. and the beginning of the new year. In 2013, Norooz falls on March 20. Norooz is a joyous occasion filled with activities including spring cleaning, coloring eggs, new clothes, the Haft Sin table containing symbolic items, prayers, greetings, gifts, and delicacies of sweets and special New Year’s dishes. Norooz is an important holiday in the Iranian calendar. Greeting Card Universe offers traditional and modern Norooz greeting cards to exchange with your friends, family, neighbors, co-workers, and anyone else you want to bless with happiness and prosperity. Order on-line, personalize with your message – you can even upload a message in Farsi or other language as a .jpg – and your cards are in the mail next business day. Or conveniently pick up your order at most local Target stores, usually within 1 hour. Persian New Year always begins on the first day of spring – the Vernal Equinox – which is symbolic of new life, rebirth, new beginnings, and renewal. The celebration has its roots in Zoroastrianism, and has been observed by the Iranian people (once known as the Persians) for at least 3,000 years. 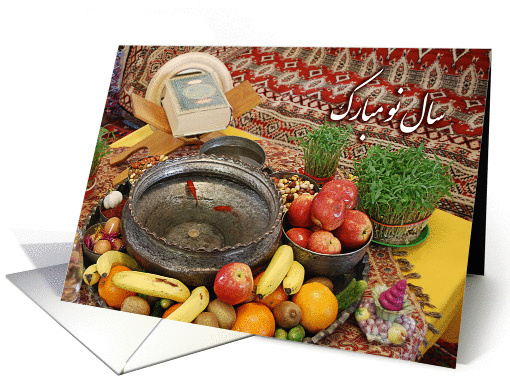 An important tradition is the Haft Sin or Seven S’s, items on a table which symbols spiritual virtues. Customarily, the Haft Sin consists of apples for beauty (Sib), dried lotus tree fruit for love (Senjed), vinegar for patience (Serkeh), sumac berries for sunrise (Somaq), garlic for health (Sir), sweet wheat germ porridge for affluence (Samanu), and a dish of sprouted wheat barley for rebirth (Sabzeh). Additional items that may be included are coins (prosperity and wealth), decorated eggs (fertility), goldfish (life), and hyacinths and tulips (spring). The colors of Persian New Year are red, white, and green – the colors of the flag of Iran. Hajji Firuz is a singing, dancing figure playing the trumpet and tambourine who heralds Persian New Year. His face is painted black and he wears red. His visit to a family’s home is supposed to bring happiness, blessings, and abundance in the coming year. Hajji Firuz is also the assistant of Amoo Norooz, who, like Santa Claus, brings gifts to children. A divination ritual practiced by some during Persian New Year is to hide somewhere and eavesdrop on other people’s conversations. Hearing good news or a positive conversation means good fortune. 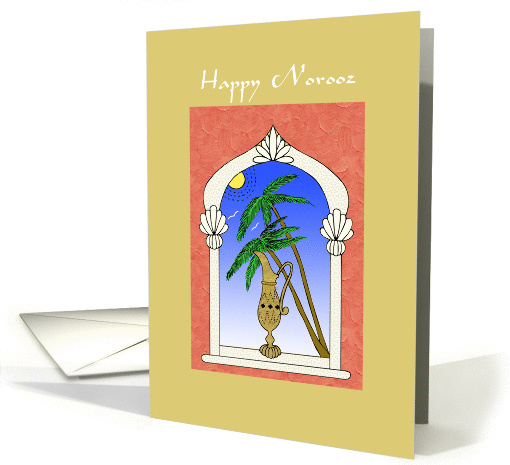 Greeting Card Universe helps you celebrate with many ways to wish your family and friends “Norooz Mubarak” with traditional and modern designs on our collection of custom Persian New Year Cards. SPECIAL: Order 10+ cards, pay only $1.99 each – use code 2012MAR199 at checkout!